Our giraffe stuffed animals are constantly reaching new heights. These stuffed giraffes and plush giraffes strive to be the best stuffed animals that they can be and it really shows. I'd even go out a limb to say that our selection of giraffe stuffed animals can't be beat. You'll spot over sixty stuffed giraffes in all kinds of sizes and styles, from the little three inch cushy kids plush giraffe to the sixty-four inch jumbo stuffed giraffe by Hansa. That's a huge stuffed giraffe! We have pink stuffed giraffes, purple stuffed giraffes, realistic plush giraffes, and even a plush giraffe backpack. 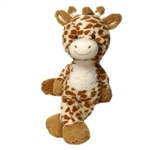 Anyone that loves giraffes is going to love this selection of great giraffe stuffed animals. You don't have to break your neck trying to find amazing stuffed giraffes, all you have to do is scroll down through the following pages and click on the pictures to learn more about each giraffe stuffed animal. Need to know more? Call us at 866-534-6604 and we'll gladly tell you all about our plush giraffes. We're not stretching the truth when we say that we love these giraffe stuffed animals!